* Questions on Using Windmill: Which Strain Measurement Package? Counters are often used in data acquisition. Digital pulses can be counted, frequency measured and the time between pulses or the width of pulses recorded. For simple counting applications the main concern is that counts shouldn't be missed. When software reads the counter regularly for long periods, it is sensible to reset the counter to zero each time. You should also consider whether the count will exceed the capacity of the counter. A 16-bit counter will count up to 65535. Cascadable counters allow a carry count to be used to join two counters together: two 16-bit counters become one 32-bit counter. What happens is that when a counter reaches its maximum count it produces a voltage pulse. You can use this as an input to another counter, thus continuing the count. It is often useful to have an output latch facility. This is storage in hardware for the count. On a command from software, the contents of all counters are simultaneously transferred to their output latches. This means that you can take a snapshot of the counters without disturbing the on-going count, especially important with cascaded counters. Frequency measurement works by counting pulses over a defined gate time, typically between 0.1 and 10 seconds. The gate time should be long enough to count sufficient pulses to give a good resolution of the frequency. The longer the gate time, though, the less often the frequency can be updated. For example, if the pulse rate is 100 Hz (cycles per second), then a gate of 0.1 seconds will count 10 pulses giving a resolution of only 10%, while a gate time of 1 second will count 100 pulses. Some hardware, like the Microlink 840 we sell, will also record the maximum, minimum and average frequency. Frequency measurement is useful when measuring speed or the rate of power consumption. A period timer measures the time taken for a number of cycles of the input signal to occur. At the end of each measurement the counter resets to zero. You can use this, for instance, to measure the speed of a conveyor belt by timing the interval between consecutive pulses. Some hardware will also measure the time that a signal is true, or the time between a start and stop pulse. You could use this to record the time when a machine is running. The timer will record how long the On signal is true and software calculates the percentage of time the machine is in use simply by comparing the total count with elapsed time. Questions on Using Windmill: Which Strain Measurement Package? I found 851-SG (775 GB pounds) and 751-SG (475 GB pounds) on your web page. I would very much appreciate it if you kindly tell me the difference between 851-SG and 751-SG. Both these systems let you monitor 16 strain gauges, switch digital outputs, count events and have the option to also measure temperature, pressure and current. They differ in two ways. 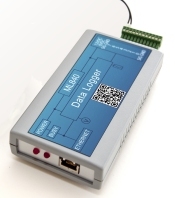 Firstly you can use the 851-SG as stand-alone data logger, whilst the 751-SG has to be continuously connected to a PC. Secondly you read data from the 851-SG over Ethernet or the Internet whereas you connect the 751-SG to the computer using USB. More on the 851-SG and the 751-SG is at https://www.windmillsoft.com/, or contact [email protected]. When using Windmill to log data to Excel, you can automatically save the data at regular intervals. We discussed how to save once a day in issue 179 (archived at https://www.windmill.co.uk/monitor179.html). You can use the same code, with a minor modification, to save data more frequently. 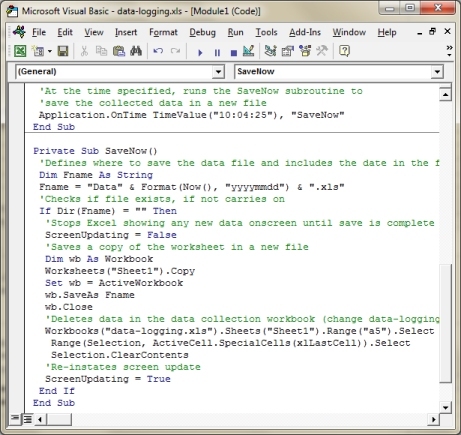 NextSaveTime = Now + TimeValue("00:01:00") Application.OnTime NextSaveTime, "SaveNow"
Fname = "Data" & Format(Now(), "yyyymmdd") & ".xls"
Fname = "Data" & Format(Now(), "yyyymmddhhmm") & ".xls"
Don't forget that if you don't need live data in Excel, you can use Windmill Logger to regularly save data to different files and then open the data file in Excel later for processing. No need for any macro programming to collect the data. If you have a question about using Excel for data logging please get in touch. The biggest experiment of its kind is camped out on the ocean north of Alaska. The machines could revolutionise our understanding of Arctic sea ice. Injuries and fatalities caused by fatigue-related accidents could be curtailed with sensors embedded into seatbelts. A prototype sensor saves power by using transistors that never fully turn "on". A team of researchers at KAIST in Daejeon, South Korea, has developed a flexible, wearable 20 x 20 mm polymer sensor that can directly measure the degree and occurrence of goose bumps (technically known as piloerection) on the skin - caused by sudden changes in body temperature or emotional states. The global market for sensors and related technologies is expected to grow to nearly $154.4 billion by 2020, with a five-year compound annual growth rate of 10.1%, according to a report by BCC Research.